Ok, let's start with the title. 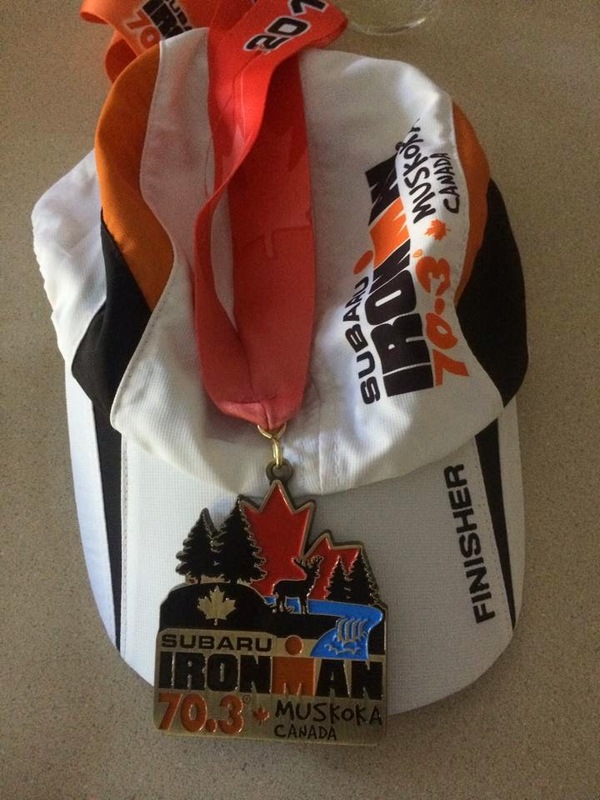 Muskoka is NOT a 70.3 despite the name, it is a 2km swim, a 94km bike ride and a 21.1km run, that equals 117.1km or 72.13 miles. All summer I heard "You know it's hilly", yes I knew it was hilly and I tried to do all my bike rides on hills and it helped...somewhat. I was relaxed and happy heading to Muskoka Friday morning with Neale. I had done the training, had my pre-race panic attack and was at peace with whatever would happen next, in other words I was in denial. We headed to the Deerhurst resort to check in and it was very very different from Tremblant, smaller and much less organized but we got through fairly quickly and did a bit of shopping before heading to get groceries and to the rental house. Our friends Anita and Andre were late leaving Ottawa so we had a nice night watching a movie and having some wine. Saturday we headed back to Deerhurst to rack our bikes and get Andre checked in and then we drove the bike course. OMG, the hills looked huge and the road covering was not the greatest in parts, I was now worried about the hills, really worried. I also realized that it was going to be an open course so I would have to deal with cars and trucks as well. My nerves were not helped by finding out that a local cyclist was killed on a charity ride at home, hit by a garbage truck. I did not know at the time but the cyclist was a member of my swim team, a mother of 2 who was about to get re-married, she was happy, healthy and full of life. My thoughts and prayer are with Laurie today, her family, friends and community will miss her greatly. Sunday morning started at 5:30am, a bit later then normal but the race had an 8am start rather then the usual 7am. We got ready and walked to the swim start. It was a water start so we got into the water 10mins before our start to warm up and then found a spot and tread water until our start time. I decided to stay close to the buoy line this time and not swim extra by staying too far left. I had a great swim start and was feeling good as I turned the first buoy. As I approached the next turn buoy the front swimmers of the last wave, Men 50+ and relays caught me. I got shoved around a bit but I held my ground and turned to the back straight. I was about 100 past the turn when the next wave of men reached me and one guy swam right over me. I reached up and grabbed him and he grabbed my arm and pulled me to the surface asking if I was OK and swam on. My biggest fear on the swim came true and I had about a km left to swim...so I did. I finished the swim in 50:25, a bit slower then I wanted but I was happy given what had happened. It was a long run to transition and as I approached transition, Andre passed me but I did not see Neale. I am slow in T1, it is hard to put compression socks on wet feet but I took a few mins off my Tremblant time. My coach told me to be in and out in 8 mins but I could not, T1 was 9:40. I headed out on the bike and it was nice, not to cool but a bit windy. The bike course in Muskoka is described as "the stick" and "the loop" The stick is an 8km section from the resort to the road around the lake and the loop is the road around the lake, we do the stick twice and the loop once. The stick is all hills and I was off to a slow start but once I got to the highway I was able to pick up my speed and instead of being the one passed I was able to pass people, even on the uphills. I was feeling good as I got to Dorset and the first aid station, I handled the long highway climbs with ease and was ready for the next section. I remembered there were some big climbs ahead and set off determined to keep up my speed when I could and pass people. It was fun seeing a cyclist in front and slowly reel them in, I had definitely improved on the flats. Every 5km was marked and I used that an opportunity to be grateful for being there, I thought of a lady named Cara and her son Tyler who committed suicide a few weeks before and the cyclist who died the day before. At the end of the loop is another hill and we have the downhill before we make a sharp left turn back onto the stick. I climbed the hill and as I crested the top an OPP officer motioned me to the left side of the lane to make the turn and allow traffic to go straight. I heard a loud muffler coming up behind me so I stayed to the right of the lane and waited for them to pass. Suddenly a pickup truck flew over the top and down the hill, going well over the posted speed limit. The OPP officer was less impressed then I was and motioned the driver to the side of the road and motioned me to make my turn, he assured me the driver would realize his error quickly. Finally I was finished the bike leg and I was soooo happy, bike time 4:16, a lot longer then I wanted but I was done. T2 is alot faster and I was in and out in 2:55. The first 3k and the last 3k of the run are really hilly, big hills and I ran as many as I could but walked one big one. On that hill I met Shelley and we ran/walked the whole half marathon together. We ran when we could and walked when we needed too and it was much better then suffering alone. I had a knot in my hamstring the whole run and I was afraid I would tear it if I pushed too hard. It was not a great run, my runs had been my downfall this summer and this one was no exception. It was faster than Tremblant but not the run I had hoped for. At the 18km mark I felt dehydrated and the medic asked me if I was OK, there was no way I was getting pulled so I said I was fine and would get medical attention at the end if I needed it. I grabbed water and as sponge and headed off. Did I mention the last 3k is hilly, we did more walking then running but eventually I saw Neale and Anita and the end was in sight. I was so happy to be done, it was a hard race and a long day, I worked hard and never gave up and most important I finished upright and smiling. Overall race time 8:09:37, slower the Tremblant and much slower then my goal and way slower them my coach's goal for me. I only saw Neale once during the race as he passed me on the bike, I was worried that it took him until the 25k mark to pass me, it usually happens much faster. He had a slower swim then me but as usual he had a great bike and run. He finished in 7:00:08 and has mentioned several places that could have cost him those 8 seconds but he is happy with his time overall. I grabbed a quick massage for my hamstring and got my stuff. We were driving home and we saw three cyclists in front of us. All of a sudden I hear Neale swear and slam on the breaks. My first thought was the car in front of us hit the cyclist but has it turns out he hit the edge of the road and fell off his bike and down the embankment. The cyclist was conscience and moving, he had a cut on his forehead and a shoulder injury and a medic from the race drove by at that moment. Since the cyclist was OK and getting medical attention we left and drove home. A shower and change of clothes and then we were off for a celebratory dinner and drinks. Another 70.3 in the books, learned lots and I have a lot of work to do before next years IM in Tremblant but I am not afraid of hard work and I am looking forward to the journey as much as the destination. Great race report! Congrats! Good luck!